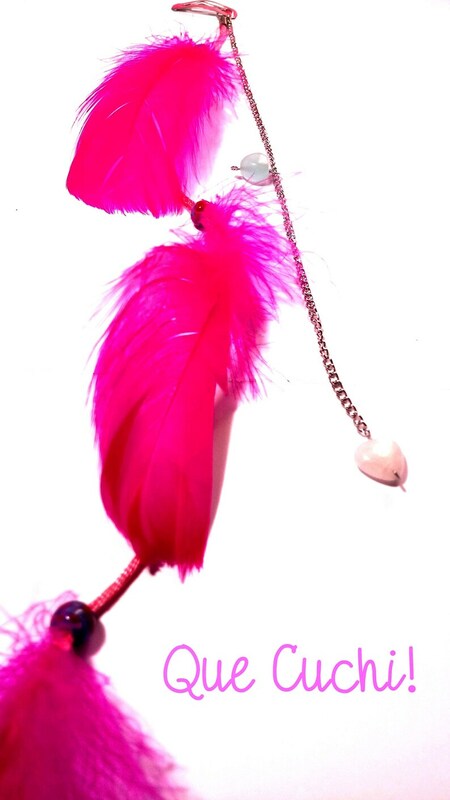 30 cm long barrette made with a pink click-clack bar, nickel-free silver-plated metal, ring and chain, stainless steel wire, a pink Quartz heart and a 1 cm blue Quartz heart, rat tail wire pink, 3 Peruvian ceramics and three feathers. I can make the barrette of another color and with other stones, it is necessary to contact me to know if I have the materials to do it is that you want. Pink Quartz calm turbulent or hyperactive children. It strengthens the heart and the circulatory system. It is used in the heart chakra, it brings tenderness, inner peace, calm, friendship and spirituality. Zodiac: Aries, Taurus, Cancer and Libra. Blue Quartz is a powerful amplifier, raises morale and promotes inner peace. Purifies our body and strengthens the immune system. It strengthens the heart, lungs and the parasympathetic nervous system. J'ai acheté cette barrette pour ma petite fille de 10 ans, mais elle ne l'a pas encore reçu. Je suis certaine qu'elle va l'aimer, car tout est joli dans cette boutique. Pulsera barroca con chips de madreperla multicolor y cuentas plateadas.